Heat the coconut oil in a large pan over a medium-high heat. Cook the sweet potato cubes for 6-8 minutes or until just softened. Add the onion and cook for another 4-5 minutes, stirring frequently. Add the garlic, chillies and ginger and cook for one minute longer until fragrant. Stir in the garam masala and cook for 30 seconds. Add the quinoa, vegetable stock, chickpeas, tomatoes and sugar. Stir to combine well. Bring to a boil, then reduce to a simmer and cover. 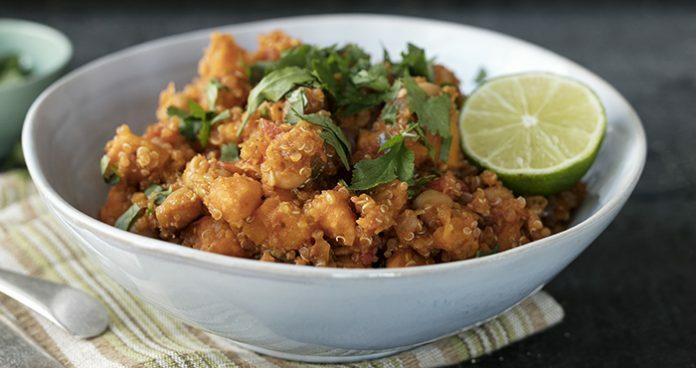 Cook for 20 minutes or until the quinoa and sweet potatoes are completely cooked through, stirring occasionally. If there is too much liquid, simmer uncovered for a few minutes to reduce. If the liquid runs out before the quinoa is cooked, add a little more stock or water and continue simmering. Add salt and pepper to taste. Squeeze over some lemon juice and scatter with fresh coriander to serve.